This was prompted by a something I read that I felt was not only highly inflammatory, but for the most part incorrect and in my personal view has no place in the realm of the martial arts. To me the martial arts have always been a wholesome and holistic activity with a main goal often being self-improvement. Some have called it a way of life. I however view it a bit more simply. To me it is a way to a better life. With that in mind, I was never a fan of the politics of destruction. I was always taught that you couldn’t create positive energy with negativity. They are polar opposite. I do not believe you can build with a wrecking ball. It pains me to at times to see such negative attacks in the world of Taekwon-Do. So with this as a backdrop, please allow me to go on. Yes indeed the Martial Arts world are infected with many schemes to make money. Perhaps this is no different from other businesses when the motive is more about profit than the Art itself. So there are many ways that Martial Arts suffer from over commercialism. One such aspect is what seems to be the rise in the many hall of fame entities that appear to spring up all around us. Naturally in a competitive business climate one can see how some of these organizations may encounter problems with maintaining the integrity of the stated goals of honoring deserving individuals. But rather than focus on the downside, I ask what is the alternative? Do Martial Art leaders that have gone above and beyond deserve some recognition for their efforts? If they were honored, would it not set an example for others to emulate, which in turn may provide motivation for further leaders that our Arts deserve? Don’t we have a collective obligation to give thanks to those that have made possible what we do today? To me it is crystal clear that without the efforts of those that came before us, we would not be in a position today enjoying the fruits of their labor! I was raised to appreciate the work and sacrifices of others! If these entities do not honor those that truly deserve it, who will? We see how the Kukkiwon Museum has ignored General Choi Hong-Hi, undoubtedly the most pivotally important figure in Taekwon-Do’s history. Therefore I prefer to be a realist and take the good with the bad, separating and understand the difference. I refuse to paint all with the same broad-brush stroke! I think it is patently unfair and most unbecoming of a martial artist to make sweeping attacks without delineating beforehand. In a more perfect world Tae Kwon Do would benefit from the experience of some older, more settled hall of fame entities like those of the 4 major sports in the United States; Baseball, Football, Basketball and Hockey. However these sports have great funding and sponsorship, often driven by advertising revenue. They all have physical structures that charge entry fees to visitors that help to cover their operating costs. This has been lacking in the international world of Tae Kwon Do. The aforementioned Kukkiwon Museum is far from adequate and that is me being polite. From an ITF perspective it is totally lacking and somewhat offensive. The WTF to date has no such vehicle and I hope someday it will move in that direction. Hopefully the recent agreement (2014) with the ITF will prompt it to be more inclusive if it eventually moves down that road. The fragmentation of the ITF has left each of the smaller parts in a weaker position to accomplish this. Other than the ITF that is supported by the Korean government in Pyongyang, none of the others have physical entities that could house such a section. Thankfully the new Taekwon-Do Sanctuary or Holy Place in Pyongyang has started to develop a wall that honors many of the Pioneers. They include Colonel Nam Tae-Hi and Sergeant 1st Class Han Cha-Kyo, who fought against north Korea in the Korean Civil War. They have also saw fit to honor the late Grandmaster Park Jung-Tae, despite his breaking away from the ITF and creating a rival organization that siphoned off many ITF members. This is a good start at leaving out or ignoring some of the politics that have plagued Tae Kwon Do, since its inception! I have been encouraging their leadership to continue this trajectory and to even include members from the other side of the aisle. The new powerhouse on the block in south Korean Taekwondo circles is the Taekwondo Promotion Foundation, which is the group that oversees the Taekwondowon in MuJu. This state of the art facility is a Taekwondo Park that has left virtually nothing out in its attempt to give students a mecca of Taekwondo. Their outreach would be more complete if they continued on with the honoring of General Choi in the section of their Museum they call the “Greats in Taekwondo History.” The absence of General Choi’s bust on a plaque besides those of his former subordinates is shocking! However they do deserve credit for moving away from the myth that Tae Kwon Do is 2,000 years old. They also accurately portray some of the early days of General Choi’s leadership and influence, including the formation of the ITF in Seoul on March 22, 1966. However this is where it ends, as it appears the ITF ceased to exist or just became part of the WTF, as future accomplishments are totally ignored. Much of the listing of the 1970s and beyond, leave out the Original Pioneers and their great accomplishments. This continues when we move to the 1980s and 90s when north Korean ITF International Instructors were dispatched to places where they actually introduced and built up Taekwon-Do there first. While this is understandable from the standpoint of the Korean political situation, it simply cannot be tolerated when it comes to the true historical record and crediting those that deserve it! I have made available to all 3 ITFs significant pieces of my research as it pertains to the very first Taekwon-Do Instructors. Many of these went on to play important roles in creating the ITF, Kukkiwon and WTF. 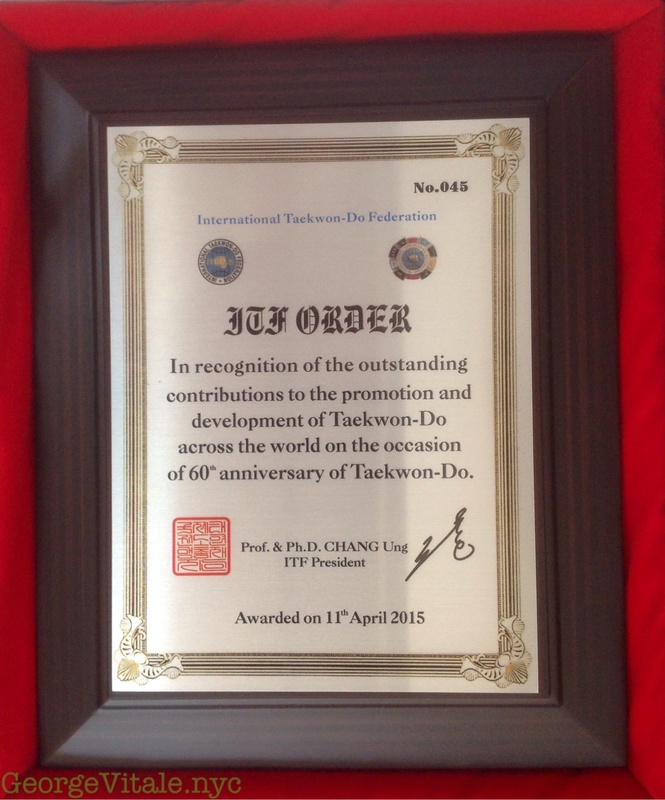 The ITF under Professor Chang Ung, PhD used this in part to identify 60 leading figures to be honored for their roles in Taekwon-Do during this the 60th Year (2015) Anniversary of the Birth of Taekwon-Do (April 11, 1955). Among those remembered for their great contributions were Grandmasters Nam Tae-Hi and Han Cha-Kyo. While all of my suggestions were not accepted fully, I am happy with the progress. While I myself was honored, I will in turn share my awards with those that I felt should have been in front of or before me. My research in this area has also been used by the ITF under Grandmaster Pablo Trajtenberg, IX Dan. His organization’s website has utilized this information to create a section they call “Page of Honor” and Pioneers. So we can see how websites can be helpful in not only disseminating and teaching people about these iconic figures, but also play a part in recognizing them for their efforts and contributions. The question then becomes, don’t these people deserve a little more than a blurb on an internet page? I for one certainly think so. The problem remains as to how do we accomplish this, given the difficult and trying circumstances surrounding the turbulent Tae Kwon Do world? I look in part to forge alliances and utilize any resource that can more laudable goals forward. A tactic that I have found useful in my work has been to utilize hall of fame entities to highlight contributions of our important Pioneers. In the past we have taken advantage of going to a banquet where numerous Pioneers would be at to interview many during one event. This sort of one-stop shopping has resulted in good benefits being attained. Now it is understandable that elaborate dinners require sizable payments. Ideally an entity like the Baseball Hall of Fame would handle the costs, including flying in and housing the honorees for their annual induction event. It is apparent that in the Tae Kwon Do world, we are not there yet! The balance between as pay to be inducted entity, with little honor and most vanity and sincere attempts to meet overhead so deserving individuals can be rightfully honor is often difficult to ascertain from the outside. I myself have been honored 6 times by various hall of fame entities. Of these, 2 did not involve dinners, so they can be excluded. Two others did involve a formal dinner, but I did not have to pay. In a recent event I was a guest, where they paid my lodging and did not charge me for the formal dinner. I was asked to speak at the event, which I was happy to do. Then I was surprised with a nice award that I did not expect or pay for. The host had become a good friend of mine and I find him to be a good, sincere man. I also took the opportunity to attend so I can meet a HapKiDo legend and pay my respects to Grandmaster Hwang Kwang-Sung, my honored senior and a Pioneer that truly deserves recognition. In only one event did I leave with a feeling I was duped into a pay for honor scheme. I was lead to believe that someone or others nominated me. The event’s timing and location coincided with a family graduation that I had to be in the area for. So I simply extended my trip and incorporated it with a visit to one of my best friends. So I was able to eliminate many out of pocket expenses by careful planning. While there were some deserving people there, I now undertake more effort to scrutinize these types of events. The last thing I will say about some of these local or smaller regional events is that some wonderful people do get a nice night out. They break bread with fellow Martial Artists and you get the opportunity to learn what a previous unknown college does in their little community. One such community is Camden New Jersey. This small urban city is across the border from Philadelphia. It is perhaps one of the toughest, most crime ridden areas in America. At the most recent hall of fame event I went to, I learned about the life a fellow Martial Artists dedicated to serving the poor and underprivileged in his community of Camden. I saw in the actual faces of his students their admiration and appreciation for his unselfish sharing with them. I have no idea if he paid for his own dinner, as it is none of my business. My sense is he paid for the dinners of his young students, the very people that he mentors. I am sure they both are better from their mutual connection. This is the “WAY” of the Martial Arts, at least in my book! So after you bath the baby in a shallow basin, please do not throw away the child with the dirty bath water! Congratulations SM Dr, George sir for your great achievements. You are doing great job for the ITF development and promotion in world wide. We all ITF members are highly appreciated to your great contribution and efforts. We are really proud with you sir. Taekwon.